The dotted line is "normal". The yellow line represents the disastrously dry weather year of 2000-2001--the year that summer hydropower production dipped so low that manipulative energy traders were able to wreak havoc on California's power markets. The green line is this year, as of yesterday. So we're now officially running below 2001--which, I should note, was the second driest year of the last 75. Now, past performance is no guarantee of future results; that's as true of weather as of stocks. 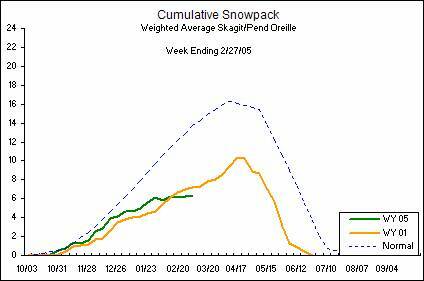 But it's going to take a whole lot of snow over the next couple of months to avoid another dry, dry summer. What would be a good quote for this graph? "The truth graph does not lie in this data". Two rain barrels last me about 10 days of watering the vegetable plants. It takes about 1/2 to 3/4 inch of rain to fill them up. It looks like a dry hot summer in the NW.